Turkish national flags are displayed in the main roundabout of Kumluca, Turkey, October 2017. From the outside, Turkey has the hallmarks of a consolidating authoritarian regime. President Recep Tayyip Erdoğan exercises near absolute control through the parliamentary majority of his Justice and Development Party (AKP), his influence over a politicized judiciary, and a stranglehold on news media and political dissent. President Erdoğan was further granted expansive emergency powers by Turkish Parliament in the wake of the July 15, 2016, coup attempt. These factors have allowed Erdoğan and the AKP to rule by decree, sideline political rivals, and enact sweeping changes to the Turkish state, constitution, and economy. But perhaps because of the AKP’s history of repression at the hands of the state, the party defined itself largely by what it opposed, conceiving of itself as a voice for the conservative, religious working class that the traditional elite had excluded and victimized. In Erdoğan, the party had a charismatic leader to drive this effort, a man who could appeal to many Turks in visceral terms, channeling their resentments and a sense that “it’s our turn” into electoral dominance. 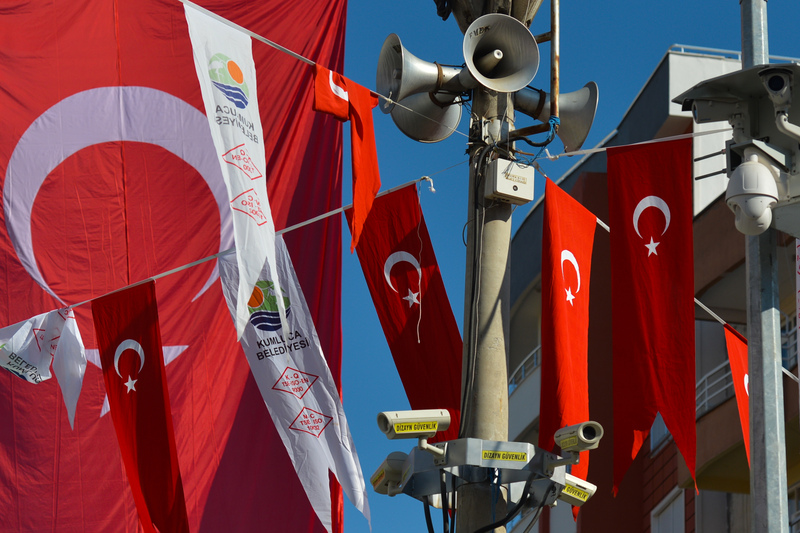 Beginning last year, the Center for American Progress set out to study Turkey’s rising nationalist sentiment and improve scholarly understanding of the dynamics of religion, ethnicity, history, grievance, class resentment, and insecurity that have fueled it. By learning more about the constituent parts of and justifications behind Turkey’s current brand of populist nationalism, CAP’s project aims to shed light on the domestic imperatives that could shape Turkey’s trajectory over the coming years—including its place in the Western cultural, political, and security architecture. Equally important, the story of how Erdoğan has used his popular politics of resentment to undermine constitutional and judicial checks may also prove helpful in understanding other cases of authoritarian populism around the world. What are the core components of modern Turkish nationalism? What is the size and shape of this constituency, and is it coherent? What are the beliefs driving its apparent resurgence? What, if anything, is new about this wave of nationalist sentiment? Is this just a replay of past efforts to unite religious Turks and the nationalist right? How much of this framework of belief is attached to Erdoğan personally—to what extent has Turkish nationalism become “Erdoğanism”? What does this transformation mean for Turkish politics moving forward and for relations with the United States and Europe? This additional report presents further reflections and analyses based on observations from the focus groups; further cross-tabulation of the polling data; and the authors’ own research. Some of these points are more qualitative or anecdotal than empirical, representing a good faith effort to better understand Turkish nationalism; these points are naturally open to interpretation and should not necessarily be treated as established fact. As part of this effort, CAP has also asked a handful of expert authors to analyze the polling data independently and will publish their commentaries in the near future. Taken as a whole, these sources and the polling data inform this report’s analytical exploration of modern Turkish nationalism and the country’s changing political landscape. The report also presents findings that highlight the contest to define and control the influential legacy of former President Mustafa Kemal Atatürk and the importance of the July 15 coup attempt against the government—two trends that stand to redefine Turkey’s national self-perception in enduring ways. Finally, the report looks at Turkey’s political outlook and party politics, as well as its approach to foreign policy, in order to better understand the tangible effects of these strains of nationalist thought. A new nationalism in Turkey? Today, the more insular, statist AKP remains dominant, relying on widespread social conservative support, a fractured opposition, and profound political polarization. Having lost the support of most Kurds and liberals, Erdoğan has sought to define a new, cohesive concept of Turkish conservatism that satisfies the traditional religious base but appeals to sufficient numbers of nationalists as a means to consolidate control of the Turkish right.7 This “AKP base plus nationalist Turks” coalition is key to securing the 50 percent support needed to pass constitutional changes and win presidential elections—such as the simultaneous presidential and parliamentary votes scheduled for November 3, 2019—unless early elections are called.8 This electoral imperative is layered on top of long-standing ideological suspicion and hostility from the AKP and Erdoğan toward secularism, urban elites, and the West—views that the AKP shares with many right-of-center Turkish nationalists. It was a political marriage of convenience made possible by more fundamental changes to society and politics. These views are not simply innate to the Turkish right, of course—outside events dramatically sharpened them. The spillover effects of the war in Syria, the resumption of the conflict with the PKK,9 and the July 15, 2016, coup attempt each represented serious threats to the state and the party—threats that produced a general right-wing “rally around the flag” effect and, to many nationalist and conservative Turks, confirmed their worst fears about Western intentions and the dubious loyalty of more cosmopolitan Turkish citizens and the political opposition. This nationalist pivot has further driven an ethnic disaggregation of Turkish politics, something against which the AKP had originally struggled. The alienation of conservative Kurds—previously a reliable AKP constituency—by Erdoğan’s tack to the nationalist right has sharpened ethnic divides, with little political crossover between Kurds and Turks. The political alignment of religious conservatives and conservative Turkish nationalists may now be solidifying into something more permanent. Erdoğan’s populist pitch and sustained dominance of politics and the news media have shifted the parameters of Turkish politics and, to some extent, Turkey’s national self-perception. By tapping into the deep insecurity and legitimate concern many Turks felt in the face of profound socio-economic changes and foreign and domestic security threats—both real and imagined—the president has fused the deep sense of victimhood that many religious conservatives feel to the anti-Western, “go-it-alone” attitude of many traditional Turkish nationalists. The West is a convenient rhetorical foil against which Erdoğan seeks to define the struggle of the faithful and the “national will” (milli irade). This adversarial outlook often leads to the logical conclusion that Turkey must go its own way—which, in turn, frees its political leaders from the pesky constraints of Western-defined liberal democracy. Indeed, Erdoğan has blamed on the West nearly every calamity to befall Turkey in the past decade, including global interest rates; sluggish economic growth; the resumption of the PKK conflict; the rise of the Democratic Union Party (PYD) in Syria; the Islamic State; the Gezi Park protests; the December 2013 corruption allegations; the Iran-sanctions evasion case against Turkish Halkbank; and, indirectly, the July 15 coup attempt.11 Furthermore, deep skepticism and even animosity for the West and the West’s intentions toward Turkey help unite Turkish religious conservatives and nationalists—crucial glue for the AKP’s electoral coalition. CAP’s analysis confirms much of this view of Turkey, a view roughly in line with what might be called a Washington consensus on Turkey, one shared by most political analysts studying the country. Much of Turkish society is deeply anxious and hostile toward the outside world; Erdoğan both reflects this widely held attitude and has helped shape it. The AKP constituency is split in its understanding of Turkishness—there is a small ethnic nationalist component; a large component whose nationalism is heavily influenced by religious conservatism; and an Islamic component, a significant part of which is described here as compassionate Islamists. The internal contradictions between these groups somewhat limit Erdoğan’s room for maneuvering. While the AKP remains solidly behind Erdoğan, there is substantial criticism of him personally as well as generalized discontent. Young AKP supporters, in particular, often view Erdoğan as the “least bad option.”15 Erdoğan and the AKP are trying to shape July 15 into a founding myth of the New Turkey, but views on the coup attempt and its aftermath are deeply split along partisan lines. Atatürk remains by far the most influential touchstone for Turks of all political stripes, and support for his legacy is one of the few points of consensus in the body politic, although that legacy is often interpreted in very different ways.16 Turkey is currently in a contested process of redefining Atatürk’s legacy and using it to establish political legitimacy. There may be a “Turkey First” nativist constituency of people angry about the influence of external powers over Turkey, Ankara’s inability to chart its own course, a perceived lack of domestic production (particularly of machinery and military hardware), and the visibility of Syrian refugees. These attitudes, however, are shared across the political spectrum and may not necessarily represent a coherent constituency; there are, of course, fascinating parallels here to the rise of right-wing populism in the United States and Europe. Erdoğan and the AKP’s nationalist pivot may be driven in part by the imperative to appeal to these currents. Turkish citizens of all political stripes are deeply hostile toward and angry with the United States and the West. Indeed, conservative Turks (AKP and MHP respondents) favor a policy of greater confrontation toward the United States. Europe and Germany both poll very poorly, although many Turks also wish for their country to emulate Europe in many ways. Russia, on the other hand, is growing in popularity but remains deeply unpopular. Overall, Turkish public opinion broadly favors a go-it-alone approach in foreign policy and sees few friends abroad. The polling data suggest that the AKP is not really an Islamist party, as it is frequently described.18 Its brand of conservative nationalism is certainly suffused in religion, but true Islamists—those seeking political implementation of Islamic law or principles in politics and the judiciary—comprise about 35 percent of the party.19 The preponderance of the AKP’s constituents are more traditional Turkish nationalists and social conservatives, leaning perhaps toward a more religious-dominant culture but more concerned with broader traditionalism and hierarchy. It is true that most AKP voters strongly agree with the statement that “Islam is central to my life and my conception of Turkish identity,” but this is an attitude shared by most Turks across party lines; it is not unique to the AKP. In fact, there is no difference between self-described “Conservatives/Religious” and “Nationalists” on this measure of religiosity nor any difference between AKP voters and MHP voters. That said, there appears to be a 25 percent to 35 percent Islamist constituency within the AKP that is politically crucial for the party as well as Erdoğan. In addition to the attitudes above regarding support for “a sharia state” and the restoration of the caliphate, 34 percent of AKP voters disagree with the proposition that Turkey should be a secular state with no official religion, and 15 percent disagree strongly. Furthermore, one-third of AKP voters agree that Atatürk’s reforms are under assault today but still support the party in power—the party that, one assumes, they consider responsible for that assault, although this causal relationship cannot be fully established by the survey. Some members of this last group might, of course, be pleased that Atatürk’s reforms are under assault. Erdoğan and the AKP may see some political warning signs with this group of compassionate Islamists, given Erdoğan’s tack toward the nationalist right. Policy shifts such as the reduction of support for Sunni rebels in Syria, rapprochement with Israel, and public spats with religious charities such as İHH may have eroded support among this group.24 But Erdoğan has also taken steps in a likely effort to please this subset of his constituency, such as his strong stand against the United States’ recognition of Jerusalem as the capital of Israel and the widespread encouragement of imam hatip religious vocational schools. (For an in-depth resource on the subject of religious education, see the 2015 CAP report, “Re-Educating Turkey.”25) These latter changes, however, may in turn anger less religious but still conservative Turks who support secularism and are skeptical of official state religion; indeed, quality of education emerged as a key complaint in the focus groups, even among AKP supporters. These issues illustrate the difficulty of Erdoğan’s political balancing act between conservative nationalists and religious conservatives within his party. In the focus groups, the anti-Syrian sentiment was strongest among MHP voters and older AKP voters, but it was visible across the political spectrum and across all age brackets and education levels. These groups shared opinions such as, “[T]he Syrians [are] all over the place, they enjoy more rights than I do, and I end up like a minority in my own country.” Another respondent said, “[W]e feel like strangers in our own country.” A third said, “I remember that I am a Turk once I see Syrians all around.” The polling largely bore this out. Overall, just 15 percent of Turks had favorable views of Syrian refugees, while 79 percent had unfavorable views. Perhaps reflecting the compassionate Islamist strain outlined above, the AKP was the softest toward refugees overall—though still very negative—with 21 percent possessing favorable views and 72 percent possessing unfavorable views. The CHP and MHP shared strong hostility, with 89 percent and 90 percent voicing unfavorable views, respectively. Only 6 percent of both groups held favorable views toward Syrian refugees. Voters from the Peoples’ Democratic Party (HDP) held 12 percent favorable views and 83 percent unfavorable views of Syrian refugees. The poll queried sentiment about refugees in two other ways as well. Respondents were presented with statements and asked to say whether they “strongly agreed,” “somewhat agreed,” “somewhat disagreed,” or “strongly disagreed” with the statement. Asked about the idea that, “Immigrants and refugees in Turkey have much to contribute to Turkish society and deserve our support,” respondents were more positive than in their attitudes toward Syrian refugees, as noted above. Overall, 49 percent of respondents agreed with the statement, and 45 percent disagreed with it. Again, the AKP was the most open to this idea, with the opposition parties more opposed to it. Across the board, older people and self-described Kemalists and secularists were more skeptical of the contributions of immigrants and refugees. However, two complications should be considered when evaluating these data. First, people may have given what they believe are “socially desirable” answers on the overall issue of the worth of immigrants and refugees.31 Second, the question’s conflation of immigrants and refugees—intended to gauge broader hostility toward outsiders, not just Syrians—may have introduced uncertainty; Balkan immigrants to Turkey, for example, may believe immigrants make important contributions but still resent the presence of Syrian refugees. The second additional question asked people to respond to the statement that, “Turkey spends too much time and money caring for refugees from other countries and should focus more on its own citizens.” This was driven by the ubiquity of this sentiment in the focus groups, and the results were overwhelming. Overall, 78 percent of people agreed with this idea, with just 17 percent disagreeing. While the AKP was again more open to spending on care for refugees—perhaps reflecting the compassionate Islamist segment of the party—a mere 22 percent opposed the idea that Turkey was spending too much on refugees. This widespread hostility to spending for refugees was particularly strong among older, more educated, and wealthier voters as well as among self-described Kemalists, secularists, and Alevis. This particular hostility lines up with partisan leanings; those groups lean toward the opposition parties. But the hostility from the groups mentioned above might also be due to greater perceived cultural differences between those blocs and the new Syrian arrivals or, perhaps, due to the perception that the Syrians favor the AKP—regarded as a political opponent for these demographics. The rise of anti-Syrian sentiment puts the government in a very tough position. Politically, an important compassionate Islamist segment of the AKP is proud of Turkey’s care for their fellow Muslims—indeed, this seemed to be an important part of their national self-perception of Turkey as a strong and magnanimous Muslim power. These voters might be disappointed by moves to cut back on assistance to the Syrians. The table below shows that approval for Erdoğan’s job performance is well-correlated with respondents’ views on how much should be spent to care for refugees. On the other hand, the more nationalist “Turkey First” constituency is deeply hostile to the Turkish state’s aid to the Syrians. More fundamentally, the social ramifications of reducing assistance to the millions of Syrians residing in Turkey are potentially disastrous, including economic desperation and public health risks. But the anger about this assistance presents a potential political opening for right-wing challengers to Erdoğan—such as Akşener, should she choose to elevate the issue.32 This anti-immigrant resentment is reminiscent of right-wing attitudes in the United States and Europe,33 with participants often saying “[Syrians] receive more than we do just for coming here”—arguing that it is easier for Syrians to collect state assistance than for Turks—and that “I feel like a stranger in my own country.” Whether these attitudes are based in fact is somewhat beside the point given their prevalence. This situation also presents a conundrum for European Union policymakers trying to address the refugee crisis and maintain Turkey as a relatively stable neighbor—the refugees desperately need assistance but such help can further deepen Turkish resentment of the new arrivals. Given the depth of the nationalist sentiments outlined in the previous section; the durability of Kemalist school curricula highlighting the importance of the republic’s founder; and the current siege mentality, it is perhaps no surprise that Atatürk remains the dominant, defining political-historical figure across Turkish society. For all that political observers have written about the overturning of the secular republic and the cultural rehabilitation and elevation of the Ottoman Empire, Atatürk remains the central point of reference for all political parties. But there is a partisan divide over the meaning of Atatürk’s legacy, reflecting the often-explicit political battles over his legacy.34 While voters from all parties have overwhelmingly positive views of the republic’s founder, the opposition—particularly the CHP—agree strongly with the proposition that “Atatürk’s reforms are under assault in Turkey today.” Meanwhile, AKP voters do not see any contradiction between their party’s openness to religious expression and Atatürk’s secular legacy and strongly reject the notion that his reforms are under attack. It should be noted that a significant minority of MHP voters also reject the notion of a modern-day attack on the secular republic. Overall, more educated respondents, as well as self-described Kemalists, seculars, liberals, and democrats, were more likely to believe Atatürk’s reforms are under assault today. This is likely because these blocs view Atatürk’s reforms as fundamentally securing Turkey as a secular nation. AKP voters, meanwhile, may be more likely to conceive of Atatürk as a nationalist and strong champion of Turkish interests against the West. In this vein, AKP voters overwhelmingly believe that “Turkey under Erdoğan is fulfilling Atatürk’s ideal of a strong and independent nation,” while, unsurprisingly, CHP and HDP voters reject this notion. The MHP is deeply split on this question, perhaps reflecting Erdoğan’s outreach to MHP voters, MHP Chairman Devlet Bahçeli’s support to Erdoğan in recent times, or many MHP voters’ statist inclinations. Erdoğan and the AKP have sought to re-appropriate Atatürk, reworking his legacy to include religion as a core cultural component alongside the need for a strong central state and a strong leader. Erdoğan’s strongest constituencies are more likely to buy into this idea, with women, older voters, poorer voters, and less educated voters more inclined to believe that Erdoğan is fulfilling Atatürk’s vision of a strong nation. In light of these polling numbers, the efforts of the AKP, CHP, MHP, and İYİ Party each to cloak themselves in the legacy of Atatürk are not surprising.35 Indeed, Turkish politics remains, in part, a contest to seize and define the founder’s legacy, even 80 years after his death. July 15 as a founding myth of the “New Turkey”? While Erdoğan and the AKP have sought to reshape and appropriate Atatürk’s legacy, they have also made a concerted effort to build July 15 and the public’s resistance to the coup attempt into a founding myth of the “New Turkey” they are attempting to build. For Erdoğan, with no victorious independence war to elevate him alongside the Republic’s founder, July 15 serves several purposes. In one light, July 15 is the closest thing to a military victory Erdoğan has, aside from a wheezing and partial victory in the Euphrates Shield operation in Syria. This martial component is perhaps important, given many nationalist Turks’ self-perception of Turkey as a “warrior tribe” and the militaristic nature of Turkish history as taught in primary school curricula and presented in modern popular culture.36 Indeed, in the focus groups—as in Erdoğan’s speeches—respondents often placed July 15 alongside Turkey’s other great military victories, making for a sometimes dizzying oscillation between July 15, Çanakkale, the Independence War, and the conquest of then-Constantinople by Fatih Sultan Mehmet. The creation of this new myth is bolstered by new traditions such as the national holiday commemorating the coup and signs across the nation calling attention to the “epic story of July 15th.”37 These efforts serve to bolster the government’s legitimacy as the natural heir to Turkey’s martial history—while elevating the people above the military—and secure hegemony over the country’s dominant nationalist constituency. Alongside this important historical signaling role, as mentioned earlier, July 15 is a versatile founding myth for Erdoğan and the AKP because it provides a flexible tool for targeting external and internal enemies and defining the national in-group as well as the so-called other. The use of the coup as a political rallying call is hardly surprising—it was a profound national crisis—but a large portion of the Turkish public appears to view the postcoup response through a partisan lens. Overall, Turks approve of the government’s response by 49 percent to 39 percent, but views are starkly divided along partisan lines.38 Eight in 10 AKP voters approve of the response, while 70 percent of CHP voters, 51 percent of MHP voters, and 81 percent of HDP voters disapprove. Clearly, the response to this national crisis is a highly partisan topic. Again, the AKP’s most reliable constituents—women, older voters, and less-educated voters—are more supportive of the coup response. There is dissent among conservative Turks regarding the coup response, but it is largely based on the feeling that it has not gone far enough rather than concern about a purge run amok. For example, nearly half of MHP voters said the government had not done enough39—perhaps reflecting the attitude that the purge has largely bypassed the AKP’s party structures. Indeed, nearly half of those who do not approve of the coup response overall said that the government has not done enough. When more thoroughly analyzed by party vote in the November 1, 2015, general election, it emerges that many AKP voters and a majority of MHP voters feel the government has not gone far enough. In other words, while CHP and HDP voters feel that the response has gone too far, much of the dissent among conservative Turks is based on the opposite impulse. To better understand the Turkish public’s views on the government’s motivation for these actions, the poll asked if the crackdown came “because the government believes these people are a threat to the Turkish state and its people” or “because the government is trying to eliminate and intimidate critical voices.” By a narrow 42 percent to 39 percent, respondents said the actions were because the government sees real threats to the state and the Turkish people. While these views were predictably partisan, they were not as monolithic as might be expected. AKP voters broke 62 percent (the government sees a threat) to 18 percent (the government wants to eliminate dissent); CHP voters broke 27 percent to 65 percent the other way; MHP voters similarly broke 35 percent (threat) to 50 percent (eliminate dissent); and HDP voters were highly skeptical of the government, breaking 10 percent to 73 percent in the same direction. More educated and wealthier respondents were more likely to say that the actions were meant to eliminate dissent. This is likely because those groups tend to lean toward the opposition parties and might also have more access to alternative news sources that show less deference to the official government line. The poll focused on broader questions of nationalist ideology and national self-perception but also covered short-term political opinions and attitudes, including favorability ratings for the major political figures and parties. Erdoğan remains broadly popular but deeply divisive, as has been the case for some time. Fifty percent of respondents have a somewhat or very favorable attitude toward the president, while 45 percent have a somewhat or very unfavorable attitude toward him. Erdoğan is more popular among older voters and less popular among more educated voters. He remains unpopular among MHP voters (24 percent favorable, 72 percent unfavorable). As mentioned earlier, there is an ethnic divide in attitudes toward the president; 54 percent of Turks hold favorable views of Erdoğan to 42 percent unfavorable, but just 32 percent of Kurds feel favorably towards him, with 60 percent unfavorable. Asked if they approve or disapprove of Erdoğan’s handling of his presidential duties, Turks overall approved by 48 percent to 42 percent but were predictably divided. AKP voters approved by 91 percent to 6 percent, while CHP voters disapproved by 87 percent to 5 percent, MHP voters disapproved 65 percent to 26 percent, and HDP voters disapproved by 86 percent to 3 percent. Despite some observers’ belief that Erdoğan may be making inroads with MHP voters, their views of his job performance are unchanged from August 2017, when 23 percent approved and 64 percent disapproved.41 Women, older voters, and less-educated voters were more approving of Erdoğan’s job performance. One focus group participant hinted at one reason for this support among more traditional segments of Turkey, saying he supported Erdoğan because “he protects the values of his ancestors.” Another said, “[L]ike Fatih Sultan Mehmet, Erdoğan gave the country a new character and brought Turkish identity to a higher level.” Interestingly, a plurality of high school graduates (42 percent approve, 48 percent disapprove), and an outright majority of university graduates (38 percent approve, 52 percent disapprove) disapproved of Erdoğan’s handling of his presidential duties. A question asking if “a strong leader like Erdoğan is necessary to protect Turkey’s interests, and he should be free to do what is necessary to keep the country safe and prosperous” elicited more nuanced responses. Overall, 55 percent agreed and 39 percent disagreed with the idea that a strong leader like the Erdoğan was necessary and should be broadly empowered. AKP voters were predictably supportive; 86 percent agreed, while 11 percent disagreed. More interesting were the results from opposition voters, who seemed more open to the idea despite higher levels of opposition to Erdoğan specifically. Among CHP voters, 26 percent agreed, while 70 percent disagreed. Among MHP voters—just 24 percent of whom have a favorable view of Erdoğan—42 percent agreed with the need for a strong leader, while 54 percent disagreed. Younger, more educated, and wealthier people tended to disagree more strongly with the idea that a strong leader like Erdoğan was necessary. These demographic effects are likely primarily due to party affiliation—wealthier and more educated people skew toward the opposition parties. But there might also be some historical effect, whereby older voters are more likely to remember the political chaos of Turkey in the 1970s, potentially leading them to value strong executive leadership—though this is speculation. The AKP remains the most popular political party, but also remains polarizing—about 50 percent of respondents have a negative view of the ruling party. Still, the AKP’s 49 percent favorability is far better than CHP (27 percent), MHP (30 percent), HDP (13 percent), or the İYİ Party (22 percent). Interestingly, the jury appears to still be out among Kurds on the new İYİ Party, despite Akşener’s history of nationalist positions as a member of the MHP and her harsh line toward the Kurds when she was interior minister, positions which have led many analysts to conclude that Kurds will never support her. Despite this history, however, 25 percent of Kurds did not have an opinion formed on the İYİ Party, compared with just 11 percent of Turks. Furthermore, fewer Kurds reported having unfavorable views of the İYİ Party than did Turks, though the smaller number of Kurdish respondents means that these numbers are hardly definitive. Trying to measure the potential strength of Akşener and the İYİ Party is difficult, given how new the party is and how little the Turkish public knows about its platform. In March 2016, before the formation of the İYİ Party, voters were asked in a Metropoll survey who they would like to see lead the MHP, functioning as an early gauge of Akşener’s appeal. Overall, 36 percent of respondents and 64 percent of MHP voters said they would prefer Akşener to head the party, compared with just 14 percent supporting Chairman Devlet Bahçeli.42 Bahçeli subsequently resisted Akşener’s attempts to hold a party congress to choose a new leader—expected to be Akşener—succeeding with the support of the courts, which were widely presumed to be influenced by President Erdoğan, who wanted to keep his occasional ally Bahçeli at the helm of the MHP.43 In that same March 2016 survey, 21 percent of all voters said they would consider voting for the MHP if it were led by Akşener, including 76 percent of MHP voters, 15 percent of AKP voters, 16 percent of CHP voters, and 7 percent of HDP voters. Akşener’s standing appears to have fallen somewhat in the intervening two years, perhaps as the result of political attacks by Erdoğan and Bahçeli, or perhaps as a result of breaking away from the MHP to found a new party. Today, asked who they would vote for were an election to be held immediately, with undecided voters proportionately distributed, 49 percent said the AKP, 24 percent said CHP, 9 percent said MHP, 9 percent said HDP, and 7 percent said the İYİ Party. These totals would see all the opposition parties save the CHP drop below the 10 percent electoral threshold, handing a much-strengthened majority to the AKP. While this is not a direct comparison—the questions are different than in the earlier Metropoll survey—the electoral strength of Akşener and the İYİ Party, as well as the new party’s effect on other parties, is still very uncertain. Key questions regarding the 2019 presidential election include: whether the slate of opposition candidates can force a second-round runoff election; if so, which candidate—if any—is best-positioned to challenge Erdoğan head-to-head; and whether the opposition can cooperate to ensure the strongest possible challenger advances to the runoff. The answer to the first question remains deeply uncertain. Erdoğan received 52 percent of the vote in the August 2014 presidential election when he had an approval rating around 47 percent.44 His current approval rating, reported in the poll, of 48 percent is essentially unchanged—potentially arguing for a similar result. On the other hand, Erdoğan’s push for the constitutional referendum secured a narrow 51 percent majority at a time when his approval rating was slightly higher, at 52 percent.45 The AKP, meanwhile, received 49 percent in the CAP poll and has never secured 50 percent of the vote, perhaps showing Erdoğan coming up just short if you assume that partisanship will hold for the first-round presidential vote—though this is not a given. Overall, the polling evidence is far from definitive but seems to point to another razor thin margin of victory in the first-round presidential election. Even assuming that the slate of opposition candidates forces a runoff, however, there remains no clear path to an opposition victory. Further assuming that the CHP candidate is the second-place finisher and faces a runoff against Erdoğan, it would seem to require a heretofore unknown candidate to pose a serious threat. It is generally assumed that the CHP and the İYİ Party will support each other in any runoff, and HDP voters are likely to break heavily against Erdoğan. This leaves nationalist Turkish voters—particularly from the MHP—and conservative Kurds as the swing constituencies. These constituencies are, in many respects, mutually exclusive given their opposing priorities and views on many crucial questions. It would be hard even for a unified opposition to make the electoral math work in their favor. Examining the key MHP demographic shows that CHP Chairman Kemal Kılıçdaroğlu, still the presumptive CHP candidate, trails Erdoğan in overall favorability ratings among MHP voters. Among MHP voters, 23 percent hold somewhat favorable or very favorable views of Erdoğan, while 14 percent hold somewhat favorable or very favorable views of Kılıçdaroğlu. Kılıçdaroğlu also trails Erdoğan in the strength of negative sentiment; 36 percent of MHP voters hold very unfavorable views of Erdoğan, while 48 percent hold very unfavorable views of Kılıçdaroğlu. Kılıçdaroğlu’s recent focus on the cost of caring for Syrian refugees—pegged by the opposition leader at $30 billion46—may be aimed, in part, at changing these figures and drawing attention to an Erdoğan vulnerability among conservative nationalist voters. Still, absent a fresh political face or a big shift in popular sentiment, it is difficult to envision the CHP heading a competitive opposition ticket. Overall, Turkish public opinion broadly favors a go-it-alone approach in foreign policy and sees few friends abroad, particularly among its traditional allies in Europe and the United States. Turks of all political stripes feel that Turkey is too vulnerable to the power of global economic and political elites. Across party lines, Turks likewise strongly favor enhanced domestic production of military and industrial goods and want to avoid relying on other countries. While similar sentiments are likely to be widely felt by citizens of many countries, the strength of these sentiments in Turkey today is striking. Those surveyed favor an independent line in which Turkey makes its own decisions and avoids entanglements rather than focusing on cooperation with other nations, but there is a partisan divide on this question between the more nationalist AKP and MHP and the more liberal CHP and HDP. Respondents were likewise favorable—albeit narrowly—to the idea that Turkey is a natural leader for the Muslim world but were again roughly divided along partisan lines. 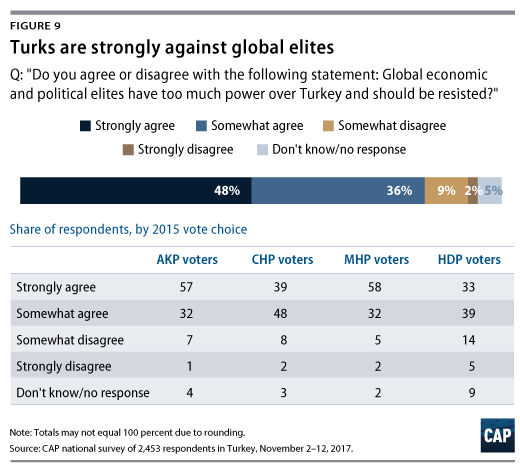 Respondents overwhelmingly agreed with the idea that “global economic and political elites have too much power over Turkey and should be resisted,” providing the context for Erdoğan’s repeated spats with foreign leaders and persistent criticism of the “interest rate lobby”47 and foreign conspiracies. Predictably, AKP and MHP voters were particularly strong in their support for this resistance, with 89 percent and 90 percent agreeing overall, respectively, and 57 percent and 58 percent strongly agreeing. The CHP and HDP were both more measured in their support but still overwhelmingly supported the idea. In this vein, huge majorities of all parties favored the idea that “Turkey should produce its own military and industrial goods and avoid relying on other countries,” an idea advanced by the AKP over the past decade, particularly through the party’s efforts to build domestic military production. Older voters and the MHP felt particularly strongly about the need for independence and resistance to global elites. 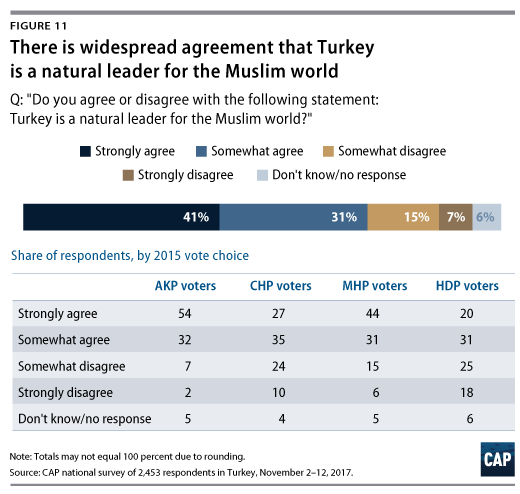 Partisan differences were visible when respondents were asked if “Turkey is a natural leader for the Muslim world,” although there was, perhaps, more agreement among the secular opposition CHP and HDP than might be expected. Overall, 72 percent agreed that Turkey is a leader for the Muslim world, while 22 percent disagreed. Older people—more likely to agree with the idea that Islam is central to their own life and their conception of Turkishness—were more likely to agree that Turkey is a natural leader for the Muslim world. Despite the partisan divides, analysts might be surprised by the extent to which the staunchly secularist CHP—who traditionally wanted little to do with the Islamic world—have internalized the AKP’s conception of pan-Islamic solidarity and Turkey as a natural leader in that space. In keeping with this defensive crouch, the Turkish public’s attitudes toward specific outside powers is overwhelmingly negative. There was particular hostility toward the United States and, to a lesser extent, Europe, but other outside bodies, such as NATO and Russia, were also viewed with suspicion. The United States was viewed favorably by just 10 percent of respondents, with 83 percent holding unfavorable views and 42 percent of respondents holding very unfavorable views. These negative views were largely consistent across all parties, with only a very slight softening of anti-American feeling among HDP voters. When asked about “the American people,” rather than “the United States,” there was a slight softening of opinion but still 72 percent unfavorable views. This hostility drives a desire for confrontation with the United States, though this desire is tempered somewhat by the realities of the relationship and breaks down along party lines. The poll asked if Turkey should “do more to confront the U.S. or do more to maintain the alliance, even if the two countries don’t always agree.”49 Overall, 46 percent of respondents said Turkey should do more to confront the United States, while 37 percent said the government should do more to maintain the alliance. The AKP supported confrontation over maintenance by 56 percent to 30 percent, while the MHP likewise favored confrontation by 51 percent to 35 percent. These responses from the more nationalist segments of the Turkish electorate are largely expected, but the results are less emphatic than on some other questions, perhaps indicating some hesitation about the ramifications of an outright break with the United States. Voters from the opposition CHP and HDP parties, meanwhile, were against confronting the United States—CHP voters by 35 percent to 49 percent and HDP voters by 26 percent to 48 percent. Across all parties, older, poorer, and less educated voters favored confrontation, and Turks were more supportive of confrontation than Kurds. 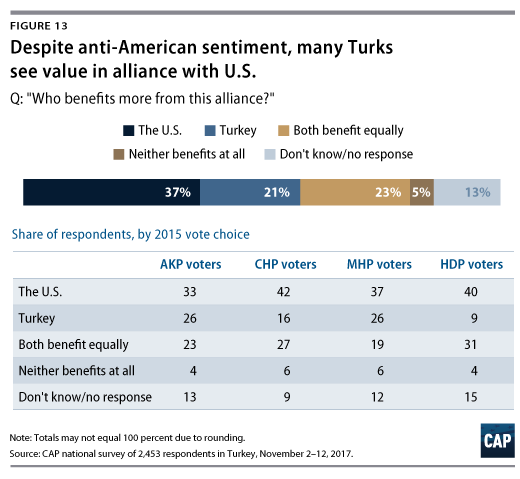 To further explore how general hostility toward the United States balances against the perceived value of the alliance, the poll asked, “[W]ho benefits more from this alliance—the U.S., Turkey, both countries, or neither country?” Overall, a plurality of respondents across all parties believe that the United States benefits more from the alliance than Turkey, though very few respondents felt the alliance was of no benefit to either country. Surprisingly, CHP and HDP voters were particularly likely to say the United States benefited more than Turkey, while voters from the more nationalist AKP and MHP were more likely to say Turkey benefits more. Older, wealthier, and social democratic voters were more likely to see mutual benefits for both countries in the alliance. This may be because wealthier and social democratic voters are more exposed to the United States—potentially having traveled there—or view it as a moderating influence on a conservative Turkish government. Older voters, meanwhile, may have more memory of the two countries’ long-standing NATO partnership, though this is speculation. When it came to attitudes toward Europe and Germany, Turks indicated similarly negative attitudes. Overall attitudes toward Europe were 21 percent favorable and 73 percent unfavorable. Toward Germany, overall attitudes were 18 percent favorable and 74 percent unfavorable. Despite this, many focus group respondents admired Europe, often expressing a desire to emigrate there; one MHP voter said, “We have relatives in Europe—they lead a comfortable life and the state attaches importance to them and provides for their welfare.” As expected, AKP voters were the most hostile, while HDP and CHP voters were the most positive about Europe and Germany. Unlike the uniformly hostile attitudes toward the United States, CHP and HDP voters showed a significant softening of opinion on Europe and Germany, with favorable ratings between 30 percent and 35 percent. These broadly negative views are perhaps not surprising given the ongoing disputes between the Turkish government and European countries on a range of issues, including EU accession; the refugee crisis; and perceived political interference in each other’s domestic affairs, such as the AKP’s efforts to campaign in Europe in the months before the April 2017 constitutional referendum.50 One AKP voter said, “Europe completely closed its doors on Turkey—Western countries try to destroy this country because Turkey gained back the power it had during the Ottoman Empire.” The poll showed some circumstantial evidence of Erdoğan using these spats as a rallying tool: There was a statistical correlation between respondents who said it was important to support Turkish kinfolk abroad and those who reported voting “Yes” in the April 16 referendum. The poll also shed some light on the much-publicized rapprochement between Russia and Turkey and its potential impact on the NATO alliance, but the data are far from decisive. Russia is viewed more positively than the United States, Germany, or Europe—a remarkable transition for a country that a plurality of Turks (36 percent) viewed as Turkey’s pre-eminent threat just two years ago.51 Still, just 28 percent of respondents viewed Russia favorably compared with the 63 percent who saw Russia unfavorably. There was little variation between political parties on views of Russia. NATO, meanwhile, was viewed favorably by just 24 percent of respondents, with 67 percent viewing the alliance unfavorably. In addition, the poll was completed before a late-November 2017 controversy at a NATO exercise that received significant negative press coverage in Turkey,52 which might further erode the alliance’s standing. The polling data and focus group observations provide some important insights into present-day Turkish politics and nationalism. Turkey remains a deeply nationalist, conservative country. Contrary to many observers’ contentions, most AKP voters do not appear to be meaningfully Islamist in their political beliefs, though a meaningful minority is. Nativism appears to be a more powerful force than religious conservatism in Turkey today, and Erdoğan and the AKP face a political tightrope in balancing their vocal religious conservative base—the compassionate Islamist wing of the party—with the anti-cosmopolitan and anti-refugee impulses of the wider Turkish right—the “Turkey Firsters.” On that note, the Syrian refugee issue seems to have escalated in the past two years—it is now among the most important sources of anger and resentment among Turks generally, particularly on the right. The Turkish electorate is pessimistic about the direction of the country and the economy. While Erdoğan remains by far the most popular political figure in the country, there is growing discontent among young voters, including among the AKP. The challenges of long-term incumbency and high youth unemployment are taking a toll. Balancing this growing generational gap is the unswerving loyalty of key AKP constituencies, particularly older and poorer voters, and the devotion of conservative women to Erdoğan personally. The electorate is divided along ethnic lines, and Kurdish voters have moved heavily against the AKP. Kurds are more open-minded toward Akşener than generally expected, given her Turkish nationalist background, but the crackdown on the HDP has left many Kurdish voters without a political voice. Despite these developments, the divided opposition will struggle to challenge Erdoğan electorally, particularly given his control of the media landscape. Erdoğan is working to institutionalize his sustained electoral dominance by remaking the state, appropriating the legacy of both Atatürk and the Ottoman Empire, and crafting a new national myth around the July 15 coup attempt. But July 15 and the postcoup crackdown remain points of stark partisan disagreement—there is no national consensus on this issue. The past decade has left an indelible imprint on Turkish attitudes about foreign policy and toward outside powers, through a combination of external developments and Erdoğan’s rhetoric and actions. The Turkish public is deeply hostile toward the outside world, particularly the United States and Europe. Russia, though unpopular, is more popular than the United States or NATO. Turkish voters favor an independent-minded, go-it-alone approach to the world. The entire spectrum of Turkish politics has internalized the AKP idea that Turkey is a natural leader for the Muslim world. Beyond these granular political insights, this snapshot provides an important look at an evolving Turkish nationalism that is prickly, defensive, and conspiratorial. This outlook reflects the hostile national mood after years of security crises and terrorism threats but is also the product of Erdoğan’s rhetoric and governing choices. This new nationalism stands in stark contrast to the confident cosmopolitanism espoused by Erdoğan and the AKP in the early years of their rule. Anti-Westernism and conspiracy theory can no longer be characterized as the product of electioneering. It is a feature of Erdoğan’s approach in the eyes of the Turkish right—not a flaw. What this prevailing national mood and new emerging national self-perception means for Turkey’s place in the Western political, cultural, and security order is an important and open question. Certainly, the assumptions that underpin it—that Turkey is beset by enemies and that the West wants to weaken Turkey—do not bode well for the road ahead. Max Hoffman is the associate director of National Security and International Policy at the Center for American Progress, focusing on Turkey and the Kurdish regions. The Center for American Progress would like to thank Stiftung Mercator for its support of this project and its continued support of the Center’s research on Turkey, Europe, and their relationships with the world. The Center is also grateful to Metropoll Strategic and Social Research Center for its excellent conduct of the nationwide poll and to the Heinrich Bӧll Stiftung Washington and the Heinrich Bӧll Stiftung European Union for their support of this project.